Every father hope and dream is for his daughter or daughters to find the perfect man that will take care of her, with the same amount of respect, and care we all have for our daughters. Yes as a father myself and a storyteller this becomes a very important thought...On any given wedding day as I document my client's memories for life, I always incorporate so many of the values I share with my daughters, emotions, compassion, and love. Having your dad walk you down the wedding aisle is priceless, momentous, and symbolic, it is the true meaning of your dad giving the bride to be the blessing to marry the man you have chosen. ..Here is a perfect example of that special wedding moment I capture at Palmetto Dunes. The ceremony chairs were very well decorated with flower jars and orange bow ties, perfectly placed, the father focused on the friends and family and seeing the groom standing there waiting for his daughter. Mom with tears in her eyes, a moment she has always prayed for a special celebrating moment for everyone. The bride keeping her calm and compassion for walking down the aisle. 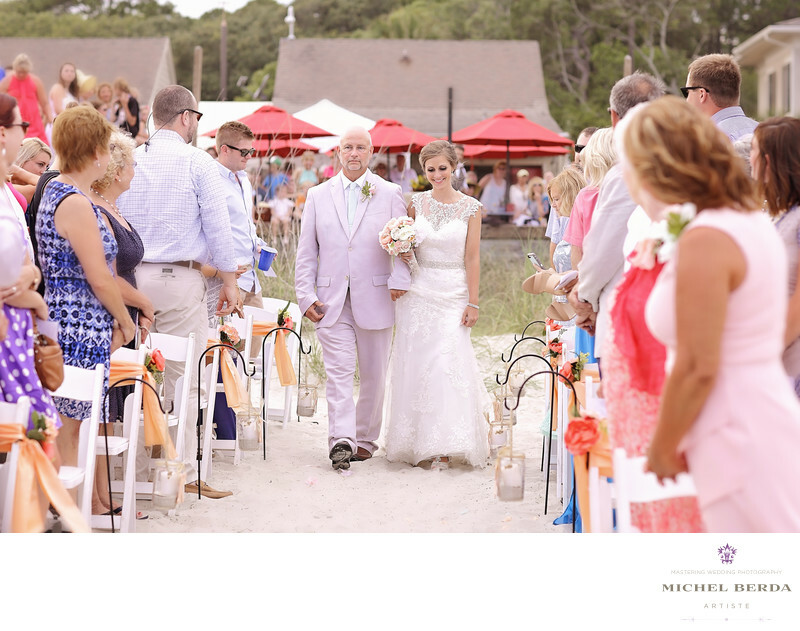 Then the onlookers behind with their expression and love for seeing a great wedding at Palmetto Dunes.Keywords: best wedding photography (45), bride (66), groom (69), Hilton Head (75), Michel Berda (1140), palmetto dunes hhi (21), photographer (1125), photography (75), sc (309), venue (45), Wedding (90), Wedding Photographer (1254), Wedding Photographers (198).